Wow your guests at your next seasonal party by serving them cupcakes that look like the beloved star of the spring season, the Easter Bunny! This recipe is perfect for hosts who would like a fancy-looking dish without doing the hard work. You can either make the cupcakes and icing from scratch, or for the sake of time, use store bought cake mix and white icing. Preheat the oven to 350 degrees F. Line a muffin pan with cupcake liners. Cream together the sugar and butter. Beat in the eggs, one at a time, and then add the vanilla extract. Combine the flour, baking powder and salt, and add to the creamed mixture. Mix well. Stir in the milk. Mix until the batter is smooth. Spoon the batter into the cupcake liners and bake for 20 – 25 minutes. Test the cupcakes by inserting a toothpick into the center of one. If the cupcakes are ready to be removed from the over, the toothpick should be clean when you remove it. Any bright white icing will do for the cupcakes, including a nice store-bought one. However if you are looking to broaden your kitchen experience, here’s a recipe for those who dare to whip up their own homemade delight. In a bowl, mix the sugar, shortening, butter, salt, water and vanilla extract. Beat on low speed until everything is combined, and then beat on medium speed for five minutes. 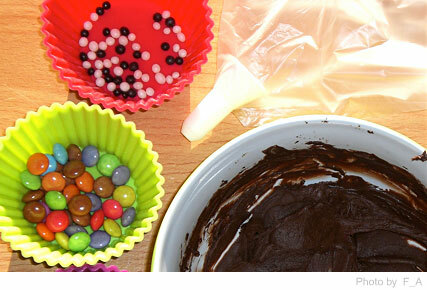 Once your cupcakes are cooled and the icing is ready, you can get to decorating with a few basic materials. Cover each of the cupcakes in white icing. Sprinkle flaked coconut over the cupcakes to create a white fur like texture. Cut each marshmallow in half and dip the sticky ends in pink decorators’ sugar. Squeeze the sides of the marshmallows to give the pieces an oval shape. Place the two pieces on the cupcake with the pink side facing upwards to look like the bunny’s ears. Put two brown M&Ms on each cupcake to look like the bunny’s eyes. Put a jellybean below the M&Ms to look like the bunny’s nose. Place two mini marshmallows on either side of the nose to look like the bunny’s cheeks. Draw whiskers protruding from the mini marshmallows using the decorators’ gel. And just like that, your adorable Easter Bunny cupcakes are ready to serve!